An easy way to display a keepsake on your Christmas tree with a transparent floating photo ornament. Ornaments are so special to me. I have been collecting them since I was in my early 20’s. I will get an ornament every year which symbolizes something special which happened that year. Actually, I end up buying other ornaments each year and lately, I have been collecting vintage old glass ornaments to go along with the few I received several years ago when my grandmother passed away. 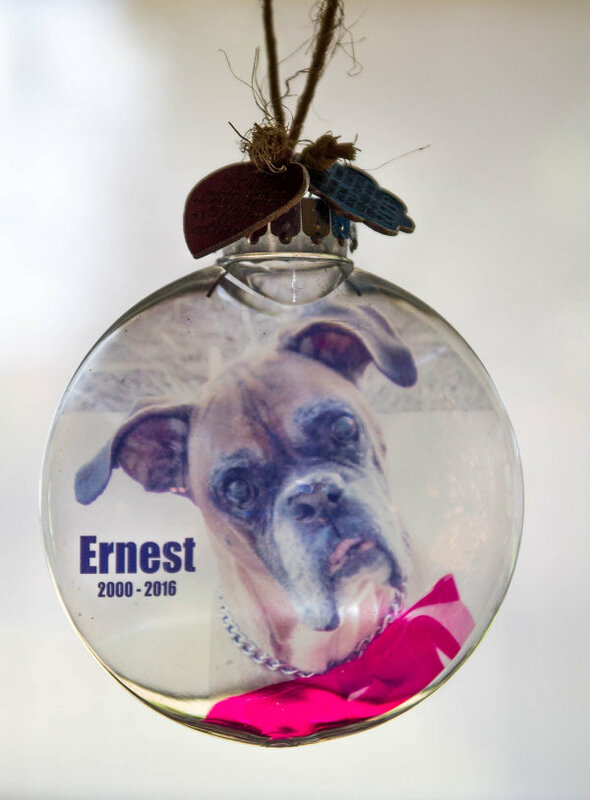 When our beloved Ernest T. Bass, the rescued boxer passed away, I wanted to make a special ornament for him. My inspiration came while I was in Hobby Lobby and I noticed a glass ornament with a transparent picture in it and I thought that would be the most perfect way to display Ernest’s picture. 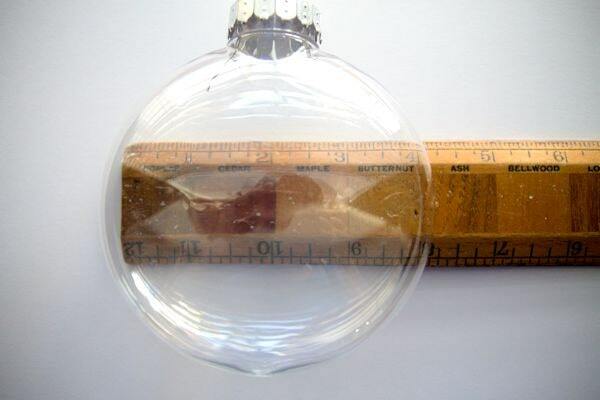 Even though I used the plastic disk (flat) ornaments, you could certainly use glass round ornaments too. 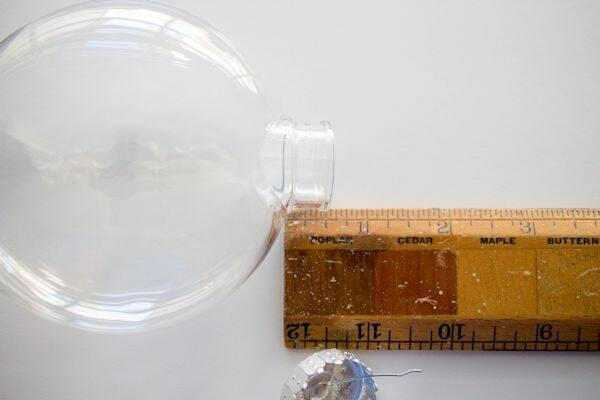 First, measure the width of your ornament or just look at the packaging. The one that I used was 4.25 inches across. 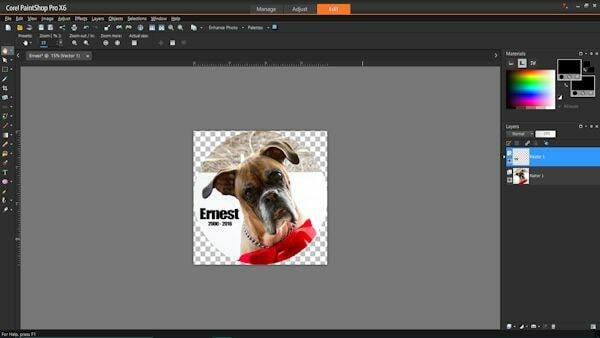 Next, select the photo you want to use. Re-size it in a photo editing program so that it is slightly smaller than the size of the ornament (I re-sized mine to 4 inches). Insert transparency paper in your printer (be sure to read package instructions first) and print your images. Check to make sure you insert the sheet in the printer the right way to print on the rough side of the sheet. The rough side is the printing side for the product I used. 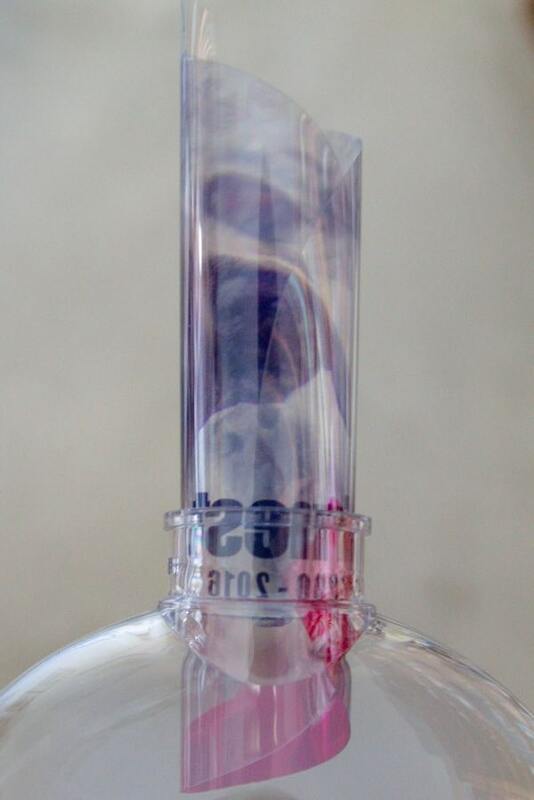 Also, handle carefully on the edges to keep fingerprints off the sheet. A laser printer works just as well for this project. 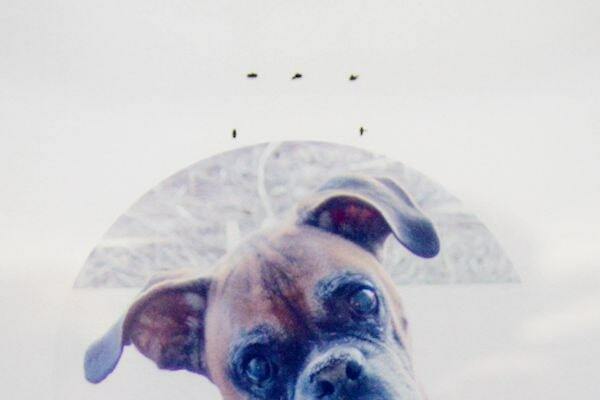 Next, let your photo sheet paper dry for a minimum of 10-15 minutes to avoid smearing them. Next, measure the top stem of the ornament. And draw (I used a Sharpie) dots to represent that size at the top of your printed out the picture and then carefully cut out your picture. Gently roll up the photo and slip it inside the hole at the top of the ornament. I used a pencil to help straighten it out once it opened up inside of the ornament. At this point, you can add other items inside your ornament, if you desire. Check out all the different types of glitter you could use in your ornament Once you are finished, put the top back on and your ornament is ready to hang. The only extra decoration I added was to cut a piece of twine and add his dog tags to it. It’s so pretty with the light from outside shining through it. What a lovely addition to our Christmas tree and a way for us to always remember our old boy. I love this idea and my teen girls would especially enjoy making them. Thanks so much for the tutorial! 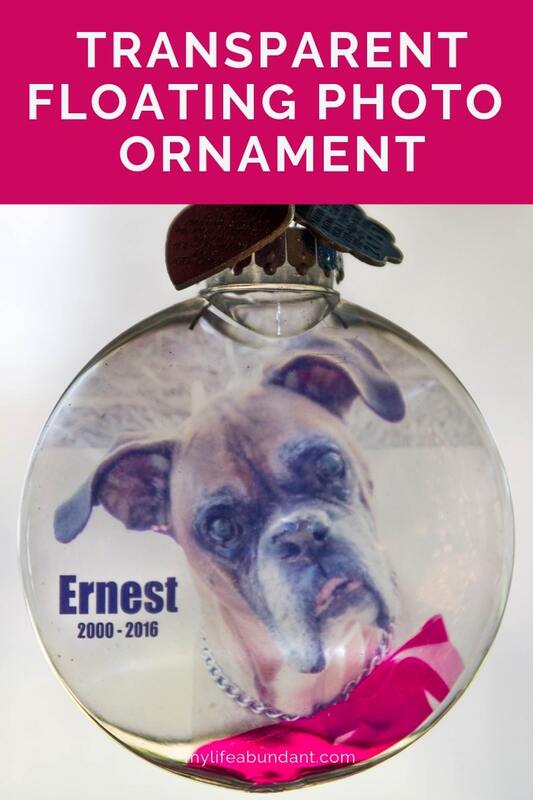 What a truly awesome way to honor and remember your beloved Ernest! The ornament is beautiful in and of itself, but when you consider the memories, it is priceless! What a sweet and simple ornament! This is a wonderful way to memorialize a loved one, with or without fur. This is so cute! I love this idea a lot, my kids would have fun helping me make this. We try to make a few new ornaments every year and this is a great one for us to make. I was wondering how you were going to flatten out the photo inside. This looks super easy – and this would be a great gift for family members. This is so cute. I can think of so many people to make these for!